supper with a food waste twist.) I even came up with a little definition (see below). For my birthday last week, I decided I’d give it a try. My NYC #susty gal pals took to the idea of a Leftovers Pooling Party right away: What a great way to clear out the fridge, bring friends together, and try out a new way to cut down on the food waste. Asking them to bring a regift to swap added to the fun. For the Chinese, fried rice represents the perfect vehicle to repurpose leftover rice — it’s less sticky than fresh, and you can literally throw into the wok or large fry pan whatever extra ingredients you have on hand to make a sumptuous meal. Here are downloadable copies of the recipes that I serendipitously found in the Wall Street Journal a few days before the Big Day. Be forewarned: The Gur cake (see recipe above), despite adding some brandy, wasn’t the biggest hit, but the vegetable whole grain fried rice and the paella fried rice definitely were. Try them at your own Leftovers Pooling Party. 2. Shine a spotlight on familiar foods that are based on leftovers. Start with French Toast and what I discovered this week: fried rice, which is actually better with leftover rice because it’s less sticky. (#WhoKnew?) Start with simple foods like bread, bread crumbs, croutons and even Gur Cake, made from bread crumbs. 3. Request a doggie bag to take home uneaten food from restaurants; better yet, bring your own doggie bags. I try to bring two ziploc bags in my purse for that extra half a sandwich without the waste associated with most other types of doggie bags. Zip bags also come in handy for packi ng up leftovers at the many sustainability and other types of events I regularly go to here in NYC. Fredrica Rudell adds, ‘Organizers of campus and community events where food is served — especially ‘groaning board’ buffets — should routinely have baggies or take-home containers on hand for that purpose.’ Until that practice becomes more commonplace, let’s all pack a few bags or containers for our friends and neighbors to rescue those extra half sandwiches and stranded cheese cubes, too. 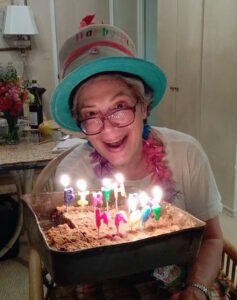 Jacquie Ottman posing with the Gur cake she made for her Leftovers Pooling Birthday Party. Needless to say, a good time was had by all (helped by regift swap (“Everyone takes home a party favor”) at my inaugural Leftovers Pooling party. And the excitement of the evening surrounding impending Hillary acceptance speech at the DNC only added to the fun. Had all my #susty gal pals not rushed home at 9 pm to watch the speech, we’d still be sipping the Limoncello one guest thoughtfully brought. Next time, I might just try making my own with some leftover lemons. Eat them cold out of the fridge. Eat them for breakfast the next day. Give them to the dog. Heat them up on another night. Repurpose them into a whole new meal. Take them to work for lunch the next day. Doesn't apply– I don't like leftovers. My food is so delicious that I hardly have any leftovers! Feel free to let everyone else know your favorite ways to repurpose leftovers by adding a comment below! 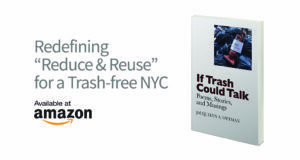 Posting Guidelines: – This and other stories published on WeHateToWaste.com are intended to prompt productive conversation about practical solutions for preventing waste. Opinions expressed are solely those of the contributors and WeHateToWaste implies no endorsement of the products or organizations mentioned. This is great! I have been trying to cut down on my food waste and generally overlook leftovers. This seems like a fun way to see friends and get more room in the fridge while having an environmental focus! I tend cook ahead to make large batches of food for the freezer. And eating leftovers is usual for us. But if we haven’t used everything up quickly, I will divide foods into single serve portions and freeze them, such as Turkey With Trimmings. beans and rice, etc. Leftover vegetables, rice get frozen for future meals or to add to soups. Enjoyed this post. I don’t know how many other folks have leftover pooling parties, but I think it’s a fine idea. I am quite obsessive of taking care of any leftovers from restaurants or my own previous cooking, and do the compost/organic waste drop-off for everything else. Thanks for continuing with your work. Also thanks for introducing me to Rogier earlier this year – we’re still collaborating. As a senior at college I find myself continually complaining about having too many ingredients/food for one individual. While my mom sometimes visits with small portions of ingredients/food and I do have several meal swipes for days when I do not have the time or energy to create a decently portioned meal– one I could eat out a few days, but not a whole week– I am often discouraged from cooking because I worry about how much leftover I produce with each cooking adventure– for someone who is just starting to cook it sure is an adventure. Yet, here is a great way to become less intimidated about cooking a meal: a leftover party! I might also make an extra effort to try to organize with roommates this year so that we could share our meals frequently. Fun idea! I find that my ‘leftovers’ are the leafy greens atop of vegetables that always seem like such a waste to throw away. I’ve now been making salads with the tops of beets or radishes. Carrot tops can be used too. They’re a little more bitter, so rather than put them in a salad they can be used to make a pesto – although typically I just use them to flavor a stock. Now whenever I buy these vegetables at the grocery store, I always feel like I’m getting a two-for-one deal! This article shines a positive light on an issue that is often shrouded in ‘doom and gloom’. 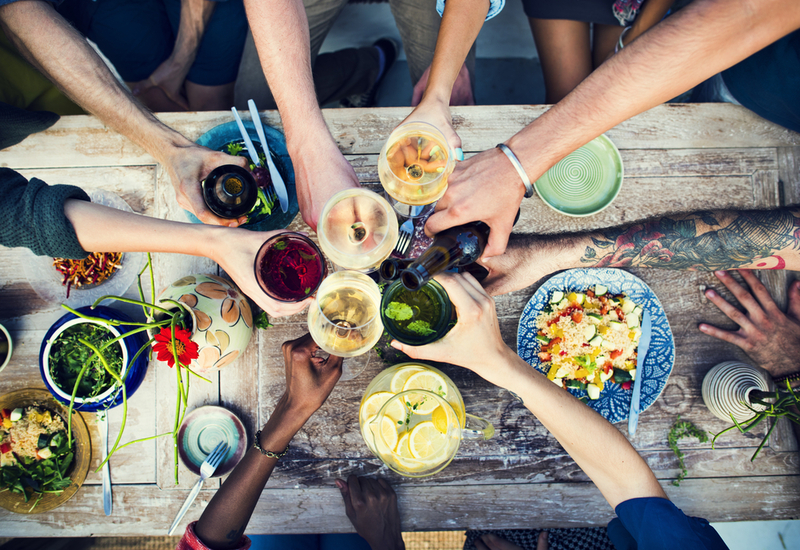 What better way to reduce food waste than to do so with friends?! It is an especially novel concept, considering how the notion of leftovers, especially bringing leftovers to another person’s party, was once seen as taboo. As many people don’t want to eat their leftovers because they have grown tired of eating the same food all week, throwing a “Leftovers Pooling Party” is the greatest way to sample different cuisines from the neighborhood. These are great ways to cut down food waste! To think how much useable food gets pointlessly thrown away makes me cringe. Such a simple and convenient way to put leftovers to good use– while having a little fun too! Thanks for the idea! I love this idea! My friends and I have done clothing exchanges in the past, but I hadn’t thought to do something similar with food, until now! Will have to give it a try soon. I’m also really excited about these recipes; I’ve been trying to figure out ways to repurpose my leftovers into a new meal, and fried rice sounds like a great way to go. This is such a great idea! My fiancé and I almost always make too much food because most recipes make more than 2 servings. I will definitely try this out some time. Thanks for the tips! Useful information for daily living and maintenance. Thes tips prevent waste and allow one to get the most out of the produce throughout the week. Eco-friendly, fun and delicious! At school, I learned how easy it is to make Korean-style fried rice from old rice in the rice cooker. Apparently, it’s actually better to use older (cold) rice because the grains are less sticky and will ‘fluff up’ on a wok. Try it with oyster sauce, spam, a little bit of Kim (seaweed) and Kimchi. I love this idea! I feel like sometimes dinner parties can feel so formal, but this gives a potluck a new casual flair. I honestly believe food tastes better the next day anyway. This is such a fun idea to truly make sure all of those left overs are being eaten! I think it’s something that can become tradition for people and where friends can exchange leftover recipes. If this idea was to be promoted on social media and become a common “after thanksgiving get together”, I believe it could bring reducing food waste around the holidays to the next level. You gave me an idea to spread the word on our social media; feel free to help magnify! What a great idea! I will definitely do this with friends and family. Especially now given that Thanksgiving just happened and there are still so many leftovers remaining! Wonderful ideas! Wasting food isn’t an option for me, so I always look for options to turn them into something surprising and delicious. 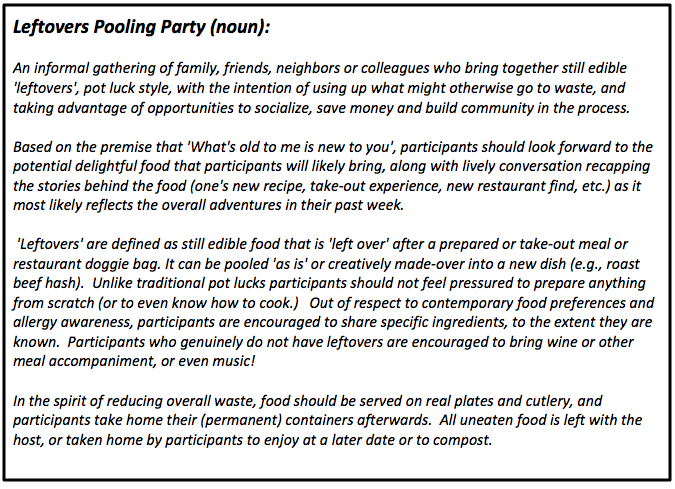 Like most of the commenters here, I agree that throwing a “Leftovers Pooling Party” is a great, and fun, idea. Reading this post reminded me of something similar my senior year college roommates and I used to do. Since our dinner schedules rarely lined up during the crazy last year of college, we usually cooked, or bought, our own personal meals throughout the week. By the time the weekend rolled around, our fridge was filled with leftovers. One Sunday night when we were all around, we had the idea of pooling our leftovers into one big meal and eating together. Thus, our “Sunday Family Dinners” were born. These Family Dinners were always a great way to end the week, and I am glad we were able to avoid wasting food unnecessarily. Love this idea of ‘Sunday Family Dinners’ Charles. I’d really like to see the notion of leftovers pooling parties catch hold in our society. Sunday makes sense and ‘family dinners’ alot more aspirational than my own descriptive “leftovers pooling’. Would be interesting to see how many of your roommates kept the tradition going once they graduated, and in what form. Having just moved into a London flat for the semester, my fellow American flatmates and I are beginning to panic about providing food for ourselves for the first time in our lives, in an expensive and foreign city. Thankfully this blog post has come to the rescue! A Leftovers Pooling Party takes away both the stress of trying to prepare the perfect serving size and also avoids wasting left-over take-out that is typically forgotten in the excitement of new restaurants and recipes. It’s also the perfect excuse to invite new friends to our flat, which is valuable in a study abroad setting where social connections are few and far between. Not only is a Leftovers Pooling Party both practical and fun, but the eco-friendly nature of the celebration makes it a must-do for environmental studies majors such as myself. Thanks so much for the great idea! I also just moved, recently starting a lease on my first apartment since I graduated from college. This year, my New Year’s resolution was to cook or eat leftovers in the apartment as much as I could. I reused the take-out containers to bring food to work the next day, washed them out, and used them until they wore out. But I knew I could do better. Though I’ve stuck to my goal, my cooking skills leave a bit to be desired. To avoid disaster, I often stick to a few simple recipes, cooking chicken, for example, mixing it into a salad one night, eating it with broccoli and a bit of teriyaki sauce another night etc. As much as I love some of these recipes, it can become a bit monotonous. A Leftovers Pooling Party is a great way to stick to my goal, spend some time with my friends without going out, and get ideas about new ways to “spice things up.” I’m looking forward to trying it out, and, who knows, maybe my cooking skills will even improve! I will definitely be trying some of these ideas! As a college student used to cooking for one, I always find myself with excess leftovers for days. I absolutely love the idea of repurposing my food and making the whole process fun and exciting by creating a “Leftovers Pooling Party”! Other students would be thrilled to join in on this idea too- it saves money, food, and effort. One less dinner plan to worry about, but still something to have some fun with! Growing up my parents always made us eat everything on our plate and we were not allowed to throw out any food. Any leftovers would be eaten the next day, or we would have a “leftover dinner.” I think this is a really cool idea though. It is really interesting to put a lot of leftovers together and remake them. As much as I would love to do this though, I feel like a lot of my friends would be grossed out with having a remade leftover dinner. It’s more socially acceptable to cook meals from scratch when making dinner with friends, so getting them past that may take some convincing. As a college junior I have found that finding the balance between being healthy/cost effective through cooking for myself, and not having excess amounts of leftovers is tricky. A leftover party is perfect to still encourage cooking for yourself, yet also repurpose the leftovers (and a great excuse to have dinner with friends)! The main message of this article is extremely relevant and should be understood by everyone. Food waste is a big issue in todays consumer-driven economy, yet it is an action that can be easily monitored. These tips are fun reminders that food should rarely have to go straight in the garbage. It could also be fun to add in a little competition and see who has the most interesting/healthy/tasty leftovers at the dinner. My friends that are great cooks would jump at the idea to show off the creative and healthy dishes they cook for themselves. Jackie, a great idea to mix a social opportunity with reducing waste! As many other people have commented here, I am also a college student that finds cooking for myself to be both expensive, time consuming, and wasteful. This idea, of having a potluck style leftovers party, seems like a great way to remedy this. I would love to set up a club or weekly arrangement with my friends or just other students of my university to do this regularly. If this was done in an organized platform, I would often cook for myself some large meal, knowing that later in the week I would have to have leftovers anyways. It would be killing two birds with one stone. Great way to reduce food waste and allow me to spread my culinary wings! This is such a fun idea! Food can go bad so quickly, and it is not always easy to eat leftovers before they spoil. I have three roommates and we always talk about how we get so tired of eating the same types of meals all the time. 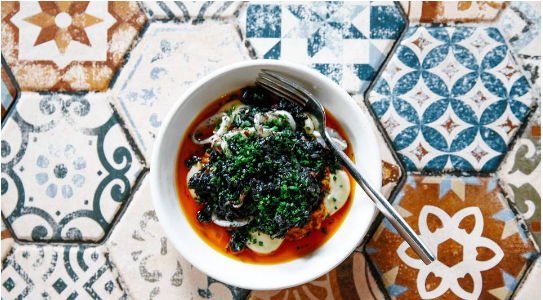 Remaking already-made dishes is something that we definitely need to try! We have had potlucks before and they always end up being a lot of fun, so I can’t wait to try this. This is the best idea ever. I love having dinner get togethers with my friends, not to mention my tendency to over-prepare for my personal dinners! I almost always have leftovers. Leftovers get a bad stigma, but with a toss in a saucepan, they can be completely reinvigorated, maybe even in combination with other leftovers. Also, this is funny, because once I realized I can almost never finish the food a restaurant gives me, I started bringing along my own Tupperware! Such a more preserving, better concealed, and more satisfying way to take home a meal! After all, it’s a waste of food and money to leave it on the plate. This is so great. Food waste makes up a really big portion of the waste that’s produced so it’s important to explore alternatives for where it can go. Brian Paganini actually has another awesome alternative to food waste. It’s called Quantum Biopower and it’s a power plant located in Southington, Connecticut that uses Anaerobic Digestion to turn food waste into renewable energy. I provided the link below! While Anaerobic Digestion is fairly complex, a left overs party is such a simple and awesome solution to food waste. This is a great idea! Food waste is criminal- not only does it directly contribute to climate change, but to throw food away when so many are starving is simply wrong. You would think that given the billions of pounds of food produced every year, there would be no food insecurity, however this is not the case, and this is why we must change our consumption habits. Obviously, the problem of food waste exists on a very large scale, however it is small actions like this that can start our transition to a more secure food system! This is an awesome article which makes re-purposing leftovers seem super easy. I have some stale bread that I’m going to use for french toast in the morning! I also have to say that I’m with you on the BYOB leftover bags, I keep a tupperware and spork in my backpack all the time. What a fun way to stop food waste! I love the concept of making the dinner a social event making it more fun. When I was in college my roommates and I would cook dinner together once a week and would each try to contribute ingredients that were just about to expire to eliminate waste. A great way to save money and enjoy time with friends. This positive attitude towards leftovers is really amazing! Going along with the idea of incorporating leftovers into a social event, I think it could also be a fun idea to gather friends and family to host a competition similar to that of the reality TV show “Chopped”. Using “mystery baskets” of leftover food to see which team can make the best-tasting dish with the greatest variety of leftovers would be a really fun and sustainable social gathering!